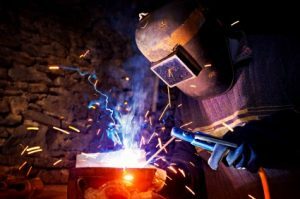 Millions of today’s most-skilled manufacturing workers will retire over the next decade; however, the educational system in America has pursued a path focused almost exclusively on preparing students for entrance into 4-year college degree programs. This leaves a perpetual disconnect between the needs of employers in manufacturing sectors and most high school curricula, and leaves many students behind. Portland’s industry leaders and the public school system have long been aware that young people in our community are not acquiring the information and skills required to successfully pursue a career in manufacturing. A 2012 study completed by the Columbia-Willamette Workforce Collaborative found that 47% of manufacturing companies identified the lack of new workers entering the industry as a top concern, with 68% stating that they anticipated having the most difficulty filling highly-paid skilled production positions over the next three years. 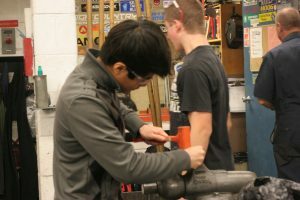 At the request of regional manufacturers, the Manufacturing 21 Coalition and in response to the needs expressed by area high schools, Impact NW created Pathways to Manufacturing in partnership with Daimler Trucks North America and Vigor Industrial. Working with schools and industry partners, the Pathways to Manufacturing Program creates clear pathways to careers in the manufacturing industry among Portland area youth and their families. The result is a larger number of young people successfully entering manufacturing careers to meet the increasing need for qualified workforce in the manufacturing industry in Portland and surrounding areas. The Pathways to Manufacturing Program is currently available at Franklin, Centennial, Rosemary Anderson and David Douglas High Schools, as well as Reynolds Learning Academy.